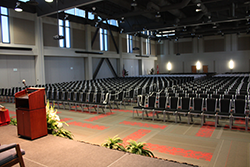 The El Dorado Conference Center boasts the 10,590 square feet Murphy Hall. This elegant, expansive space with 25-foot ceilings can be utilized for large events or partitioned into 3 separate halls for more intimate gatherings. Each separate hall has identical Audio/Visual capabilities with it's own large retractable screen and projector system. We can also custom configure the lighting with the use of adjustable fixtures and window screens. We have a moveable stage that can be sized up or down to fit any occasion. And when it is party time we can provide a unique parquet dance floor that is sure to be a hit for all your guests. Hungry? Let our Executive Chef and his team take care of all your dining details. From light Hors-Doeuvres to banquet-style feasts, we have you covered.